Heated streets will melt ice and snow on contact. Sensors will monitor traffic and protect pedestrians. Driverless shuttles will carry people to their doors. 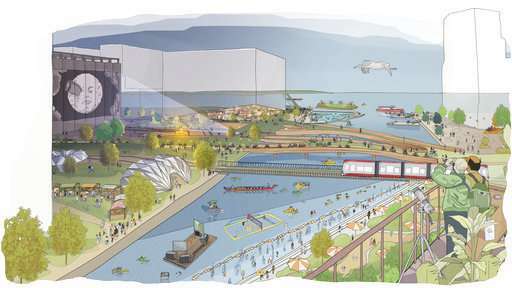 A unit of Google's parent company Alphabet is proposing to turn a rundown part of Toronto's waterfront into what may be the most wired community in history—to "fundamentally refine what urban life can be." 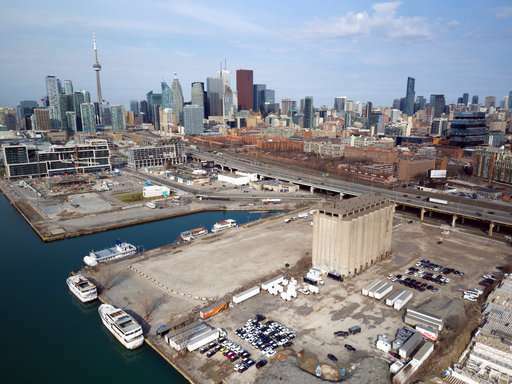 Sidewalk Labs has partnered with a government agency known as Waterfront Toronto with plans to erect mid-rise apartments, offices, shops and a school on a 12-acre (4.9-hectare) site—a first step toward what it hopes will eventually be a 800-acre (325-hectare) development. High-level interest is clear: Prime Minister Justin Trudeau and Alphabet's then-Executive Chairman Eric Schmidt appeared together to announce the plan last October. But some Canadians are rethinking the privacy implications of giving one of the most data-hungry companies on the planet the means to wire up everything from street lights to pavement. And some want the public to get a cut of the revenue from products developed using Canada's largest city as an urban laboratory. "The Waterfront Toronto executives and board are too dumb to realize they are getting played," said former BlackBerry chief executive Jim Balsillie, a smartphone pioneer considered a national hero who also said the federal government is pushing the board to approve it. "Google knew what they wanted. And the politicians wanted a PR splash and the Waterfront board didn't know what they are doing. And the citizens of Toronto and Canada are going to pay the price," Balsillie said. Dan Doctoroff, the CEO of Sidewalk Labs, envisions features like pavement that lights up to warn pedestrians of approaching streetcars. Flexible heated enclosures—described as "raincoats" for buildings—will be deployed based on weather data during Toronto's bitter winters. Robotic waste-sorting systems will detect when a garbage bin is full and remove it before raccoons descend. "Those are great uses of data that can improve the quality of life of people,' he said. "That's what we want to do." Sidewalk Labs promotional materials promise "a place that's enhanced by digital technology and data, without giving up the privacy and security that everyone deserves." Doctoroff said the company isn't looking to monetize people's personal information in the way that Google does now with search information. 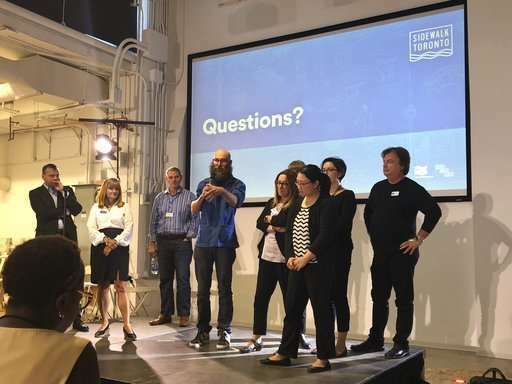 He said the plan is to invent so-far-undefined products and services that Sidewalk Labs can market elsewhere. "People automatically assume because of our relationship to Alphabet and Google that they will be treated one way or another. We have never said anything" about the data issue, he said. "To be honest people should give us some time. Be patient." But that wasn't good enough for Julie Di Lorenzo, a prominent Toronto developer who resigned from the Waterfront Toronto board over the project. Di Lorenzo said data and what Google wants to do with it should be front and center in the discussions. She also believes the government agency has given the Google affiliate too much power over how the project develops. "How can (Waterfront Toronto), a corporation established by three levels of democratically elected government, have shared values with a limited, for-profit company whose premise is embedded data collection?" Di Lorenzo asked. Di Lorenzo asks who will own the autonomous vehicles. "Is the municipality maintaining the fleet or forcing you to share your vehicle?" She also asks if people who don't want their data collected will be allowed to live there. "It gives all of us pause," Waterfront board chair Helen Burstyn acknowledged. 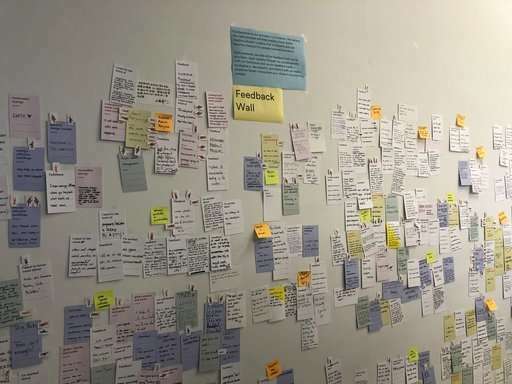 Bianca Wylie, an advocate of open government, said it remains deeply troubling that Sidewalk Labs still hasn't said who will own data produced by the project or how it will be monetized. Google is here to make money, she said, and Canadians should benefit from any data or products developed from it. "We are not here to be someone's research and development lab," she said, "to be a loss leader for products they want to sell globally." Ottawa patent lawyer Natalie Raffoul said the fact that the current agreement leaves ownership of data issues for later shows that it wasn't properly drafted and means patents derived from the data will default to Google. "We just can't be too trusting of corporations," she said. "Everybody gets worried about the digital and technology aspects that might run amok," she said. "I don't worry about that as much as I see the opportunities for developing a really interesting, innovative community." "Google is ahead of governments globally and locally. That's a cause for concern but it's also an opportunity," Vaughan said.